The global prepacked chromatography columns market is an extremely consolidated arena, with the top two players, namely GE Healthcare and Repligen, accounting for 78.0% of the overall market in 2015. GE alone represented whopping 54.0% of the market in the same year. These players are paying high attention towards product innovation and engaging themselves in mergers and acquisitions to maintain their leadership in the market, finds Transparency Market Research (TMR) in a study. For instance, with the acquisition of Atoll, Repligen is anticipated to cover a larger share in the market in the forthcoming years. 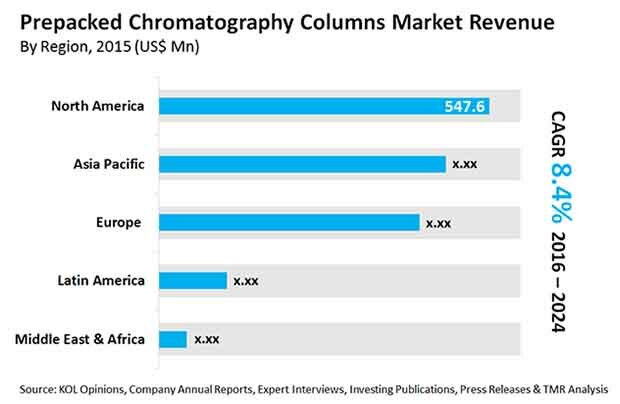 The valuation of the global prepacked chromatography columns market was US$1.74 bn in 2016 and is poised to reach US$3.34 bn by 2024, progressing at a CAGR of 8.4% therein. On the basis of technology, hydrophobic stationary phase will continue to dominate until 2024, commanding 72.8% of the overall market. Increasing investments and funding along with uptick in research and development activities in the life sciences, biotechnology, and pharmaceutical sectors are supplementing the growth of the segment. On the other hand, multimodal chromatography is expected to register a CAGR higher than any other segment during the review period. Geographically, North America was the frontrunner in the market in terms of revenue in 2016. However, Asia Pacific is anticipated to surpass the region towards the end of the forecast period. The growing investments by international players and improving scenario for research and development activities are providing a significant momentum to the market in the region. Owing to these factors, the region is estimated to rise at a CAGR of 10.2% during the same period. The soaring need for therapeutic monoclonal antibodies in the treatment of various diseases such as allergic diseases, cancer, and autoimmune disorders is creating a staggering volume of demand for prepacked chromatography columns. Moreover, the growing production of biopharmaceutical drugs is paving way for higher need for purification, which in turn is working in favor of the market. “Biopharmaceuticals require exceptional purity, thereby making downstream process an important component of the overall process,” says a TMR analyst. In addition, the burgeoning demand from other end-user industries such as food and beverages, chemicals, and biotechnology is augmenting the market. Furthermore, increasing research and development activities in the field and rising government initiatives and awareness campaigns are providing the market with a conducive environment to foster. Volatile economic conditions in certain parts of the world have considerable impact on government budgets and available funding for the healthcare sector. This in turn is adversely affecting the growth of the global prepacked chromatography columns market. Additionally, the high prices of columns are limiting their widespread adoption. Furthermore, issues such as fouling and clogging are hampering the growth prospects of the market. Fouling and clogging results in the reduction of dynamic binding capacity (DBC) and a subsequent decrease in the life span of columns.